Wowee, what a few weeks we have had, who said that the off season is boring? 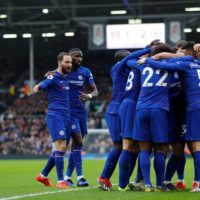 Iceland keep defying the odds, Messi made his shock exit from international football, Germany is starting to shape up as the favourite for the EUROs, and who is going to become the next England coach? While we cannot answer that question, the least we can do is run through this big boot spots from the EUROs and Copa America. Custom boots have run amuck in this week’s spotting, check out what caught our eye this week. Similar to Paul Pogba and his custom Pogboom ACE 16+ PureControl, Dele Alli and Mesut Ozil have been given special PureControl boots that feature the same patriotic touch to each of their boots. 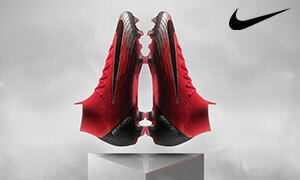 Alli’s boots also feature the writing ‘Bambam’ on the heel, while Ozil’s feature his shirt number. The boots are a nice little touch from adidas, and this probably suggests that the tabs on the boots will be fully customisable if they ever hit miadidas. Xhaka went from feeling the highest of highs last week when he finally completed his deal with Arsenal, but then became a villain as he fudged his penalty for Switzerland in their knockout game against Poland. He did it all wearing some customised boots, with the boots he wore against Poland as well as France in their final group game being custom boots, thought to be by LA Studio Kickasso Kustoms. Considering he is one of UA’s biggest stars, expect to see Xhaka in plenty of big time ads with Under Armour come the start of next season. Bertrand’s boots are blackout boots…but at the same time they are kinda not. Bertrand has taken a permanent marker to his new Total Crimson/Volt/Pink Blast Mercurial Vapor XI, but it seems to us that he got half way through the job and then decided to ditch the idea. Bertrand has been chopping and changing his boots for quite some time now, having worn blackout Hypervenom Phantoms during last season, it seems the full back cannot quite commit to one single technicolour boot. 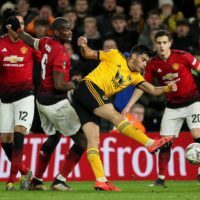 The X16.1 has not been released in a blackout colourway yet (even though we do believe adidas will be releasing one in the next few days), but it seems Sergio Romero could not quite wait until one is officially launched by adidas. 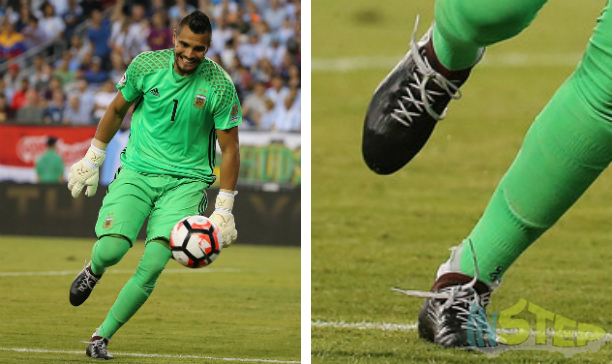 The ‘keeper has had his own pair of X16.1s blacked out, but this is actually one of a number of blackout boots that the Argentine had on rotation from his stable of boots during the Copa America. He was also spotted in a blackout Superfly V and a blackout ACE 16.1 throughout the tournament. I probably should not even call these boots a Magista Obra anymore. Banega has strangely cut off the whole Dynamic Fit Collar from his Nike Magista Obra boots, leaving him with a Magista Opus with a Flyknit upper. 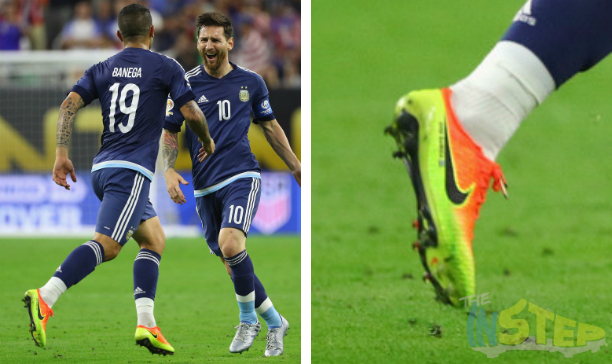 While we have seen a few players perhaps shorten the Dynamic Fit Collar from their boots, not too many have been as dramatic as Banega has been with his boots. That is it for our boot spotting today, what was your favourite boot spot this week? Share your thoughts in the comments section below. 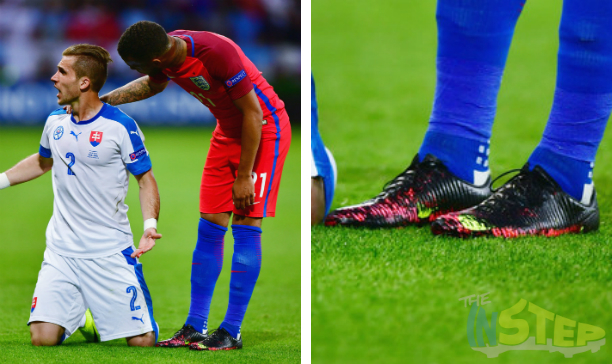 I like the low cut magista!